Reading. I already did two reading challenge posts (here and here) so you know most of what I’ve been reading. Apart from that, I read Scribbleboy by Philip Ridley, which was mostly good but also kind of annoying. Each character had their own manner of speaking (e.g., speaking only in raps, one ending every sentence with “baby”) and some of them just really irritated me! Watching. The BFG! The original animated film, not the new one. A childhood favourite and just as good as an adult ❤ Also, on a different note, fireworks. 1st August is the Swiss national holiday and Basel has fireworks over the Rhine on the 31st so we went to see them. We decided not to go to the official celebration on the actual national holiday and then discovered you can actually see the fireworks for that one from our window. Good to know! Listening to. Travis (remember them?). We had tickets to watch them perform in Arlesheim, so I refreshed my memory of their songs before we went. It was a great setting for a concert and I really enjoyed myself. Fran just seemed like a nice, chatty older man rather than a member of a band that was once pretty famous! Going. (The category for places that are too close to really call it “travelling”!) To Delémont, which is in the French-speaking canton of Jura. We hiked a bit in the woods then looked at the pretty old town. Eating. Ice cream! It’s been so hot here recently and what else does one eat when it’s hot? We finally tried out the little ice cream place just down the road from us that opened in April then also discovered a new Italian ice cream place in town when Jan’s mum and her partner were visiting. That’s it for today. What have you been doing lately? If you’re curious about what other bloggers got up to in July, check out the link up. Recently some friends from England came to visit me in Basel as part of a mini trip through Europe. After they left us, they moved on to Lausanne so Jan and I decided to meet up with them there on the Saturday since we hadn’t actually made it to the French-speaking part of Switzerland yet. It was raining when we arrived, but we wanted to see the lake anyway, so the first thing we did was take the Metro to Ouchy, a former fishing village that’s now a suburb of Lausanne. With the rain getting worse, most of the group decided to pay a visit to the Olympic Museum, which was just down the road (one of our friends wasn’t interested, and after waiting for us in the cafe for a while ended up heading back into town by herself). Where are these guys’ heads?! There were some interesting things in the museum, but a lot of it felt like a giant advert for the whole Olympic idea/committee/what have you. My favourite bits were the mascots (cuteness!) and a part at the end where there were a few “hands-on” things, like a wall where you had to hit lights to test your reactions. On the other side of the lake, you can see France. Specifically, Évian-les-Bains – as in the mineral water. You can take a boat there from Ouchy. Having taken dozens of photos of the lake, we headed back towards the Metro to meet our other friend in town. While we waited for her to see our message and get in touch, we wandered around the old town. If I hadn’t experienced it for myself, I wouldn’t have believed it had been raining heavily just a few hours earlier! By this time, it had been quite a while since breakfast and we were all feeling a bit peckish, so our next stop was lunch. We went to a Brasserie that our friends had discovered on a previous evening, and I ate Rösti on the wrong side of the Röstigraben 😉 (see my post on Fribourg for more on that). To drink, I chose the beer sampler. The amber beer was my favourite! I chose Rösti Vaudois, since we were in canton Vaud. There probably would have been more to see, but one of our friends suggested buying some beer and going back to the place they were staying, so that’s what we did. Later, we happened to look out of the window and saw snow! All too soon, it was time to head back to the train station and return to Basel. I will definitely have to visit Lausanne again some time – maybe in the summer. I imagine the area around the lake will be beautiful then, and I would love to take a boat trip. 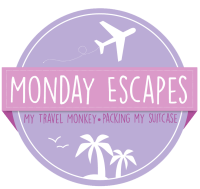 Linking up for Monday Escapes, which unbelievably has been going for almost a year!